Living in Winnipeg, 11-year-old Jake Lotocki tends to stick out from time to time. That happens when you're a die-hard New York Islanders fan in the middle of Winnipeg Jets country. 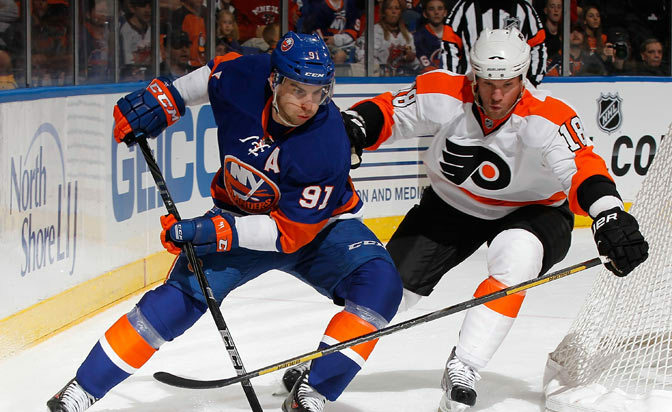 Lotocki was wearing the jersey of his favorite player, Islanders captain John Tavares, when he and his family went to MTS Centre on March 4 to watch the Islanders' win 3-2 against Winnipeg. Tavares, out for the season due to a knee injury sustained during the 2014 Sochi Olympics, isn't traveling with the team, but Lotocki's appreciation for his favorite player only grew after he was jeered that night for wearing the Islanders jersey. Two days later the Islanders were in Vancouver preparing for a game against the Canucks when Tavares called Kimber Auerbach, the Islanders' director of communications. "During the game I got a call from [Tavares] saying, 'Did you read this story about the kid in Winnipeg?'" Auerbach said. "I read the story and he texted me back saying he wanted to do something." Lotocki's story from the Jets game was recounted in an article by Paul Friesen of the Winnipeg Sun, which then was noticed by Tavares' girlfriend. A couple of phone calls later, Lotocki's mother, Sue, got a message from Auerbach and the Islanders. "We got a voicemail from Kimber with the Islanders. Jake heard it and asked, 'Is that the real New York Islanders?'" Sue Lotocki said. "To see my son's face light up, wow, it was pretty amazing." Auerbach hadn't called the Lotocki home just to say hello. He was letting the family know that the team would be sending Jake a new, autographed Tavares jersey. And the Islanders plan to invite the family to attend the team's morning skate when they play in Winnipeg next season. One local season ticket holder even reportedly offered the family tickets to an upcoming game. It's quite a turn of events for one of Tavares' biggest fans. "Jake has been following him for his whole career," Sue Lotocki said. "He just had an Olympic project. He had to pick an Olympic athlete to present on. And it was John; it's always John. He's had this bobblehead of John Tavares for years on his bedside table. It's broken, it's been stepped on, the dog has chewed on it. A couple of times I said, 'You should throw that thing away.' And he won't. "[He's a] big fan and an even bigger fan now." The jersey, along with a hand-written note, was mailed to the Lotocki home earlier this week. For Sue Lotocki, all the gestures are nice, but they aren't quite as valuable as the lesson her son has learned since that night at MTS Centre. "He's very passionate about his hockey, so it was discouraging. But I have to say things have definitely turned around," she said. "It's one thing for the mom to say to a kid, 'You be a passionate, loyal fan but be respectful.' It's a whole other thing when an NHL superstar says that. "As a mom of a hockey player and an NHL fan, I'm super-impressed. I'm glad my kid picked this NHL star to idolize."